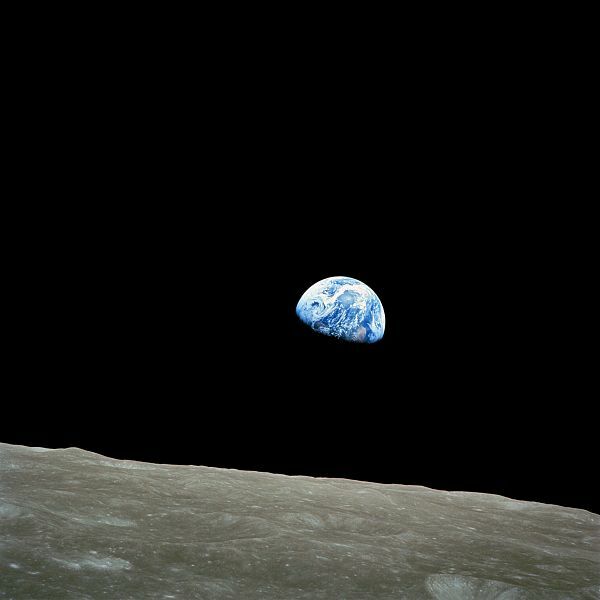 On December 24, 1968 one of the most powerful photographs of our time was captured. Today being the 45th anniversary of this event, I thought a brief look back would be fitting. The crew of Apollo 8 (Borman, Anders, and Lovell) were just finishing their fourth lunar orbit when they saw an awe inspiring sight. Due to a roll maneuver being executed by the spacecraft, the Earth came into view out of the window. As the astronauts were just coming around from the far-side, the Earth was rising over the lunar terrain! This was a sight that nobody had seen before. There was a scramble for film, first a black and white photograph, then finally a color photograph as the capsule rotated further and the event came into view of another window. Listening to the crew conversation is very interesting as they hurry to photograph the event with their Hasselblad 500EL. The "Earthrise photo" is more officially known as NASA photo AS8-14-2383. The scientific visualizations team from NASA have done a fantastic job putting together a short video showing the events that transpired with syncronized crew voice recordings. By using photos from the recent Lunar Reconnisance Orbited (LRO) and a timed camera on Apollo 8 they have even determined the exact orientation of the spacecraft during these events. I highly recommend watching it! This greatly reminds us of the sentiment Eugene Cernan expressed later in the program: "We went to explore the moon, and in fact discovered the Earth."